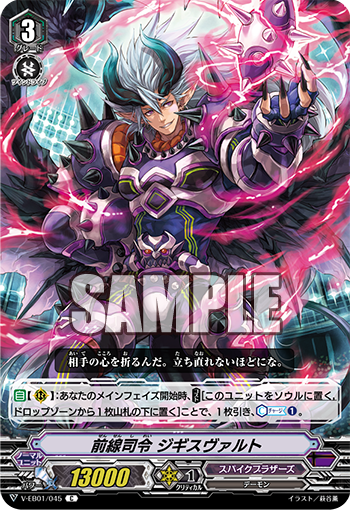 The Japanese Card of the Day for May 31st, 2018, is a Spike Brothers Common from V-Extra Booster 01: The Destructive Roar, Front Line Commander Sigiswald. Lacking both Gift and any kind of vanguard abilities makes it incredibly difficult to run. The first tournament results out of Japan are showing the only viable non-Gift grade 3s are the ones with overwhelming offensive rearguard skills like Maximum Raizer, while this card is a utility unit that only gives you 1 extra counterblast and can be easily interrupted by Dragonic Waterfall, Blaster Blade, or Berserk Dragon. The card is slow, not giving a reward for playing it until the turn after it's first used. There should be more of a reward for running a card where having it as your only ride option shuts down your gameplan. Brakki, Wonder, and Juggernaut all have one skill that resolves on-place and one that resolves at the beginning of the main phase, which ensures you get something out of the play no matter what. However, if Sigiswald is indicative of a skill shared across multiple units of different grades, a grade 2 or 1 version of him could be an instant 4-of. With three slots between Sigiswald and Funky Bazooka, there's ample room for one. The fact that both Sigiswald and Wonder Boy are capable of recycling triggers from the drop zone bodes well for Spike Brothers' coming support, as they're currently the only clan in Standard format capable of doing so. The previous Japanese Card of the Day was Bloody Hercules.